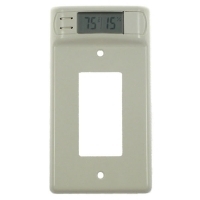 Once you replace your existing wall switch plates with these unique Plate Pals switch plate cover thermometers you'll never again have to guess what the temperature or relative humidity is in the room. Integrated into the switch plate cover is a 5/8" curved temperature and relative humidity readout display thermometer. The digital display is powered by a small watch battery (included) that is accessible from a discrete panel on the front, so no wiring is required, and the switch plate cover won't have to be removed to replace the battery. This model is suitable for use with rocker (Decora) style switches. Dimensions: 5.8" high x 3.2" wide x 0.4" deep.